See you there Dude DDD. Club Leaders / Stand Organisers - If you registered for FCS or since on FCS site for PFC Show/EXPO you WILL have a club pack posted tomorrow. If you are in a group/club that want to exhibit at Donington at our show on 12th Oct and are NOT registered please do so now. Each club with 5 or more cars gets two free entry tickets. 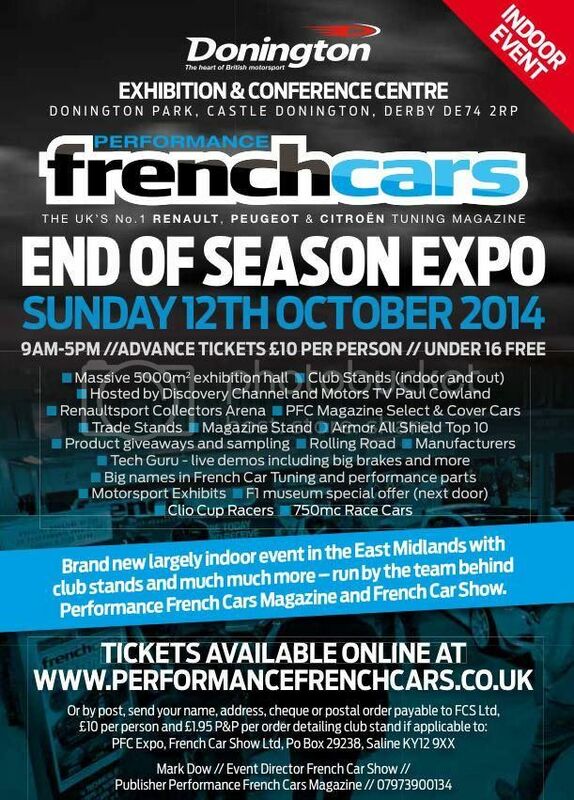 To purchase tickets please visit www.frenchcarshow.co.uk/store/ £10 per adult in advance quote your club name when booking to secure your club stand! Just one more week left to secure tickets for the show with a graphic and stand pass for only £10.00 with loads of goodies at the venue and £1000 prizes in the Crystal Cube. Its £15 on the day and 500 cars booked in. This time next week we will circulate the final stand locations and confirm the excellent list of traders booked in. Venue - Donington Park and you get 50% discount for the world famous Donington Collection of F1 cars on production of your Expo Wristband. Adults reduced to £5. Over 130 exhibits.